Please make sure at least one leader from each troop attends. Parents are always welcome! If you’d like to apply for CORI approval, please arrive 5 or 10 minutes early and bring your completed CORI form and your photo ID. Click here for an overview of the 2014-2015 calendar (PDF). For more information about upcoming events, please see individual postings under Events. Come see how the Girl Scouts of Holliston are building girls of courage, confidence and character who make the world a better place. Our experienced leaders will be available to answer questions about the many ways girls can participate, our local troops and the exciting events being planned for the upcoming year. Considering becoming a leader or volunteer? We can answer your questions about that too! This is an open event for current Girl Scouts, future Girl Scouts and anyone interested in learning more about our organization. During the month of November, the Girl Scouts are partnering with Fiske’s! 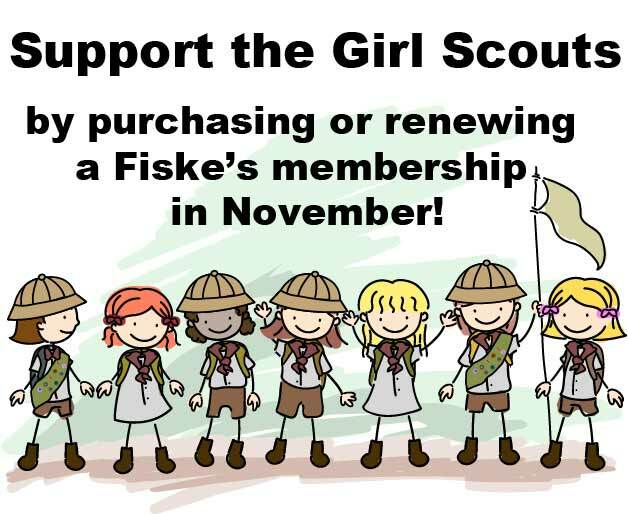 For every Friends of Fiske’s new membership or renewal, Fiske’s will donate $5 to Holliston Girl Scouts. Members receive 20% off of most everything in the store and 30% off during the last 5 days of the month. Support Girl Scouts by purchasing or renewing a membership in November and share this great fundraiser with all of your friends around town! Welcome all Holliston Girl Scout Leaders to a new Girl Scout year. Please join us for our Meet and Greet event. Meet your service team, meet other leaders, share ideas, and help us create a year our Girl Scouts will love. Beverages and dessert will be served. Every year the Holliston Girl Scouts help the Holliston Newcomers collect food for Thanksgiving Baskets for local families in need of assistance. This year the Food Drive is Saturday, November 15th at Shaw’s in Ashland. You can sign up for slots on this sign up form. The Newcomers recommend bringing 4-6 girls for each shift. More than 6 gets a little crazy – also, we don’t want to be disrespectful to Shaw’s or make it difficult for the customers to access the store. If you have more than 6 girls who want to participate, please have them split the two-hour shift and have each set of girls volunteer for one hour. Also, please indicate your troop number and level in the comments. If your troop cannot volunteer a shift at Shaw’s, please consider having them make a basket and/or cards. All finished baskets include cards, so having your troop make some would be greatly appreciated. Cards should be generic, homemade “Happy Thanksgiving” cards. They need to be completed by Friday, November 21st to be included with the finished baskets. 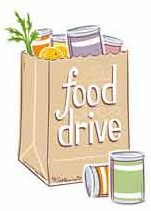 Cards can be dropped off at the Food Drive at Shaw’s on 11/15 or at 65 Cranberry Lane in a box in the front of the house. You can also email Lisa Brown to arrange drop off/pick up. To “make a basket” please put your troop’s non-perishable contributions for a Thanksgiving meal into a shopping bag. 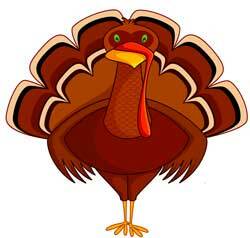 If your troop is able to include monetary donations for the turkey and pie/produce, that is also appreciated. The donation for a turkey is $20 and the pie/produce is $10. Please bring your finished basket to the Shaw’s Food Drive on 11/15 or contact Lisa Brown to arrange pick-up/drop off. Scouts are invited to learn more about America’s proud past at Old Sturbridge Village’s Scout Day event. This event is scheduled for Saturday, November 15th and offers fun activities focusing on “Citizenship and Patriotism” including hands-on studio activities designed for specific Scout levels. Please visit Old Sturbridge Village’s Scout Day information page to learn more about this event’s fees, hours, and offered activities. Holliston Girl Scouts will be hosting a Welcome to Cookie Season/Holliston Girl Scout Informational Table at the Newcomers Annual Craft Fair! Visit our table and learn more about the upcoming cookie season. Learn about how girls can get involved with Girl Scouts beyond troop participation. Check out our displays of past town events and troop activities. There will be no cookie sales or orders at this event. 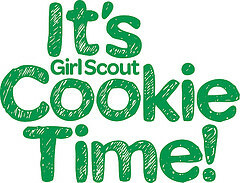 Holliston Girl Scouts are invited to join us at our Cookie Kick Off Event! Leaders and Girl Scouts can drop in as a troop or as individuals. The Girl Scouts are invited to sing carols at the Holiday Stroll on Saturday, November 29th at various spots throughout downtown Holliston from 1 pm – 6 pm. Please let Kathy Skerry know if your troop is interested (or if some of your troop are interested) – Kathy will get a final schedule emailed out to people one week prior (Saturday, Nov 22). Attached here is a copy of carols that some troops sang last year. These include simple songs that the girls enjoyed singing. They’re quick to learn and easy to follow along. Feel free to add others. One troop included a guitar and a ukelele player last year – you can make this event your own! This is not a Girl Scout sponsored event, so the whole family is welcome to come along. Every year the Senior Center brings holiday cheer to local homebound seniors by delivering wrapped gifts and homemade cards. Holliston Girl Scouts are invited to contribute to this important effort by purchasing and donating gifts and/or by making holiday cards. Holiday card and gift contributions can be dropped off at 21 Gregory Road between December 1st-9th. 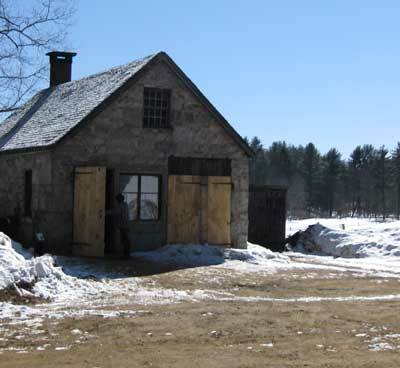 Bullard Memorial Farm is inviting Girl Scouts to a living history experience with Jan Turnquist, Executive Director of Orchard House, the Alcott family home in Concord, MA. Delightful and engaging, the author of Little Women brings us behind the scenes stories from her life. Appropriate for ages 6 and up. Reservations are required. You can learn more about this event in Bullard Memorial Farm’s event flyer. Girl Scouts can support Holliston High School’s undefeated football team at Gillette Stadium on Dec 6th! The game between Holliston High School vs Wahconah Regional High School will begin around 3:30pm (other championship games for other towns will be played before and after our game). Click here to order tickets through Ticketmaster. 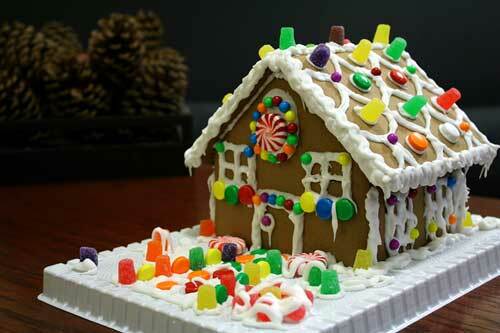 Troop leader, Lisa Brown, is working with the Newcomers Club on a Gingerbread event on Friday and Saturday 12/12 and 12/13. They would love to have older troops or individuals volunteer to help assemble houses Friday night from 6-9PM at the Mount Hollis Lodge. They also need help with the actual event on Saturday. We will have shifts between 9:30AM and 4PM. Troops have helped out in the past and it has been great! The 2nd Annual Lantern Walk is coming! From 5 – 8pm on New Year’s Eve, the Friends of the Holliston Trails Committee invites you to stroll the rail trail by way of either Blair Square (1 mi walk) or Cross Street (.25 mile walk). Along the journey to Phipps Tunnel, which will feature warm snacks and refreshments, visit the many hosted fire pits along the way! This event is free for all participants; however, donations are gladly accepted to help enhance the safety of the trails. If older Girl Scout troops are interested in hosting a fire pit (and perhaps sing songs or hand out treats to elevate the experience for revelers! ), please contact Erica Foster at ericafoster20@gmail.com – the more the merrier to make the event spectacular! Daisy Essential Training is required for new Daisy troop volunteers. Additional training prerequisites include Girl Scouting 101 and Troop Pathway Orientation. This training will help you take your learning to the next level and bring the Girl Scout Leadership Experience to life for your Daisies. Click here to register for the Natick Daisy Essential Training. 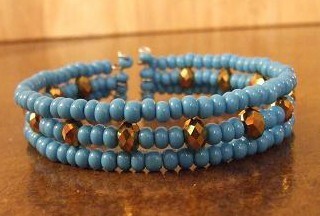 Holliston Girl Scout Leaders are invited to this crafty Leader/Daughter beading event at New England Bead Company! Leaders and their daughters will be making the artsy “boho chic cuff” shown below. Leaders have the option of picking one of the three different time slots available: 11:30am-1:30pm, 2:00pm-4:00pm, 4:30pm-6:30pm. Sign ups are required. Please register for your slot on Signup Genius at www.SignUpGenius.com/go/70A0B48A4AB23A75-leader. Local venue for Daisy training! Daisy Essential Training is required for new Daisy troop volunteers. Additional training prerequisites include Girl Scouting 101 and Troop Pathway Orientation. This training will help you take your learning to the next level and bring the Girl Scout Leadership Experience to life for your Daisies. Registration closes one week prior to training. Please register by January 5th. Click here to register for the Holliston Daisy Essential Training. Registration is required by Jan. 19th: click here to register. and plan for a great night! Any registered Holliston Girl Scout can attend with a father or other important grown-up in her life, and Girl Scouts are invited to bring a friend, too. The Square Dance is always a favorite for our Scouts! Please bring a nut free snack to share. Also, please label your container if you’d like it back. 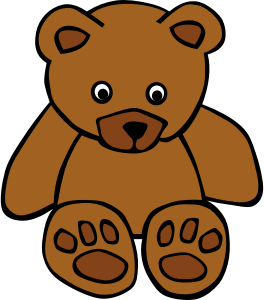 Junior Troop #72933 cordially invites our Daisy Girl Scouts to a Teddy Bear Tea on Sunday, January 25th from 2:30 – 4:00 pm at First Baptist Church. 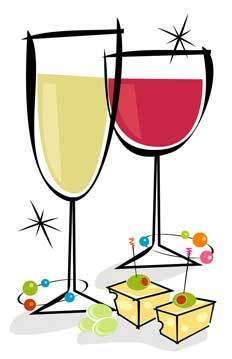 Girls will enjoy refreshments while hearing from leading women in our community and practicing their etiquette skills. Each Daisy Scout is asked to bring a new teddy bear, which will be donated to a foster child at Project Just Because. Sign up information has been sent to Daisy leaders via Sign Up Genius. Registration is required via Sign Up Genius so we can know how many Scouts will be attending and can accommodate everyone. Please contact Celeste Salley with questions or if you did not receive an invitation. Registration closes one week prior to training. Please register by January 18th. Click here to register for the Simmons Daisy Essential Training. Come spend a day with your fellow Junior, Cadette, Senior, and Ambassador Girl Scouts celebrating the uniqueness of each person! Hands on activities and discussions will explore body image and the messages girls receive through popular culture. Activities will be age-appropriate for older and younger girls. Pre-registration is required by Monday, January 5, 2014. Troop leaders of Juniors, Cadettes, Seniors, and Ambassadors will receive an email outlining all the details and registration information. 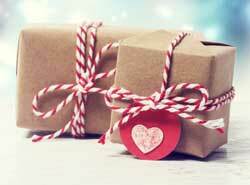 Get crafty and share some Valentine greetings! 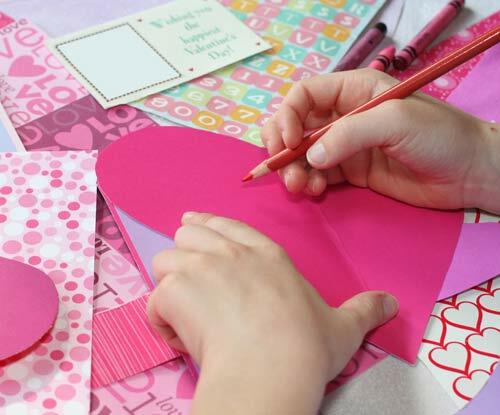 Holliston troops, individual Girl Scouts, and/or Scouts’ families are invited to create Valentine cards to be given to Seniors at the Senior Center. The cards can be dropped off at 21 Gregory Road between February 2nd through February 9th. Girls will participate in activities and games centered around the theme of Friendship! Girls who attend will complete the requirements of the Brownie Making Friends badge. 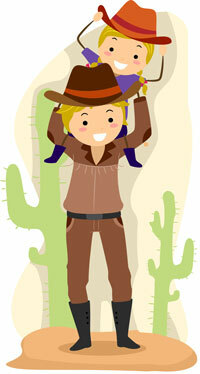 *Girls can attend with their Brownie troop or as individuals with a registered parent/adult . Please send a head count for your troop to Lisa Brown, lisciacca@hotmail.com, by February 1st. 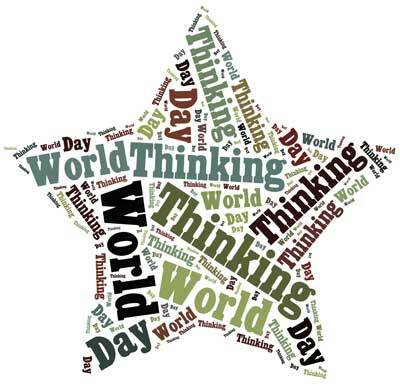 Celebrate Girl Scouting all over the globe at our World Thinking Day event on February 22nd from 2-4pm! Troops will host activities and booths to share information about scouting in other countries. 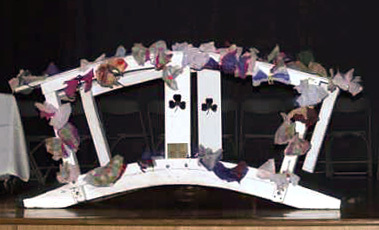 Girls may attend with their troop or individually accompanied by a parent. Mark your calendars! More information will be provided via email. Girl Scout Week is celebrated each March. During this week, our Holliston troops show our appreciation for members of our community, and Girl Scouts also have the opportunity to be recognized at our places of worship on Girl Scout Sunday and Girl Scout Shabbath. (Click here to see the flyer for Holliston Girl Scouts Worship Services (PDF)). 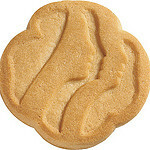 This year also marks the Girl Scout’s 103rd birthday on Thursday, March 12th! 12th: Girl Scout Birthday – Girl Scouts can wear their uniforms to school! In Girl Scouting, bridging marks the transition from one level of Scouting to the next. Participating in a bridging ceremony is a meaningful way to celebrate past accomplishments and look ahead to new adventures. It is an opportunity for family participation and a Girl Scout tradition. 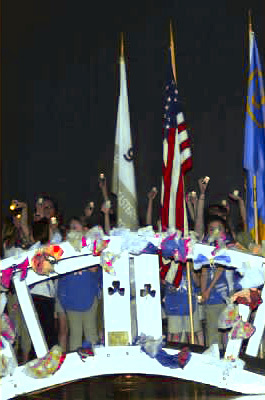 Holliston Girl Scouts will host our annual town wide bridging ceremony on May 19th at the Adams Middle School. All troops bridging, along with their families, are invited to join in this special event. During the ceremony, each girl will walk over the bridge to signify her move from one level to the next. She is greeted by a sister Scout on the other side. The bridging event is also a time to honor our troops who have completed their Bronze, Silver or Gold award over the past year. 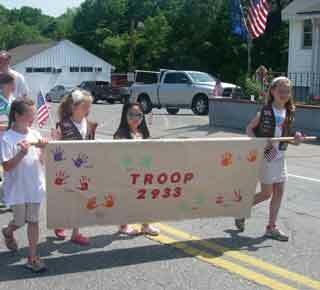 Holliston Girl Scout troops are invited to march in the Memorial Day Parade! 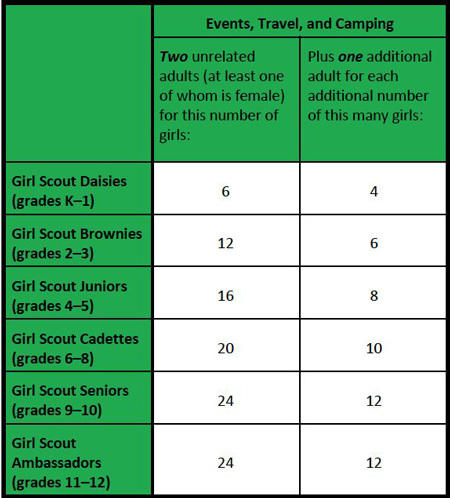 Girls must be accompanied by their troop leaders or a registered adult. Reservations and payments due April 10th! Reservations and payment MUST be made by April 10th!